Boko Haram’s commitment to the jihadi group the Islamic State, has just become even more pronounced, after the Nigerian terrorist organization changed its name to ISWAP or Islamic State’s West Africa Province. Links between the two militant Islamist organizations have grown over the last year. A recent video released by IS sang the praises of Boko Haram fighters, while the Nigeria-based militant group also released a propaganda video, via IS’s social media channels. The accounts dropped the name Boko Haram, as well as its official title, Jama'atu Ahlis Sunna Lidda'awati wal-Jihad, Arabic for “People Committed to the Propagation of the Prophet's Teachings and Jihad.” Instead the Nigerian group was referred to as ISWAP. The photographs all carried the logos, which have been typically seen in official IS material that has been published. This would appear to show that the terror group, which has carved out large amounts of territory in Iraq and Syria has taken full control of Boko Haram’s propaganda. 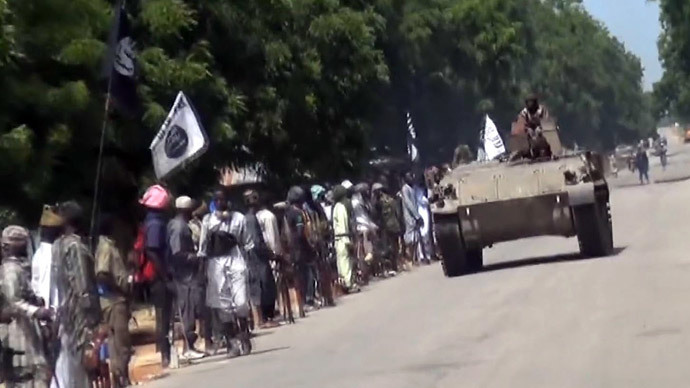 It is also the first time in over a month that Boko Haram has officially released any footage of their militants. The faces of the African militant fighters were not covered, while some were also wearing uniforms. Photographs showed the jihadists menacingly brandishing guns and rocket launchers, while the black and white flag belonging to IS was also clearly visible. The Nigeria-based Daily Times mentioned the photos were probably taken in the Sambisa Forest, which is believed to be the group’s last stronghold. In March, the leader of the Nigerian terror group, Abubakar Shekau, pledged allegiance to IS. The group accepted the vow. “Our caliph, God save him, has accepted the pledge of loyalty of our brothers of Boko Haram so we congratulate Muslims and our jihadi brothers in West Africa,” Reuters quoted Islamic State spokesman Abu Mohammad Adnani as saying in an audio message in March. He was referring to self-proclaimed IS leader Abu Bakr Baghdadi. Boko Haram, which was founded in 2002 and means ‘Western education is forbidden,’ has suffered a series of demoralizing defeats in recent weeks against what seems to be, a rejuvenated Nigerian army. They had previously controlled an area the size of Belgium. Troops from Cameroon, Chad and Niger have also joined the pan-African fight against Boko Haram. According to Amnesty International estimations in January, the militant force had around 15,000 troops at their disposal. The Nigerian terrorist organization has been concentrated in the north east of Nigeria. They have tired to carve out an Islamic caliphate, which adheres to a strict interpretation of Sharia law. The group shocked the world in 2014 after taking over 200 girls hostage from a school, with the intention of selling them at markets. An international hunt to try and find the girls has so far failed. They have also carried out numerous bombing missions and often targeted schools and education facilities. The Washington-based Council on Foreign Relations, stated that Boko Haram killed more than 10,000 people in 2014.